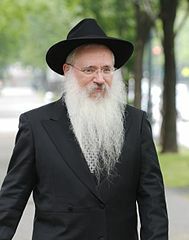 Manis Friedman (full name: Menachem Manis HaKohen Friedman, Hebrew: מנחם מניס הכהן פרידמן‎; born 1946) is a Chabad Lubavitch Hassid, Shliach, rabbi, author, social philosopher and public speaker. He is also the dean of the Bais Chana Institute of Jewish Studies. Friedman authored Doesn't Anyone Blush Anymore?, which was published in 1990 and is currently in its fourth printing. He is featured in the documentary films: The Lost Key (2014) and The Jewish Journey: America (2015). We are the last hope. It's exciting. It is not an exaggeration to say that we are living in Messianic times. Messianic times means when the World is ready to become normal. We are ready. The World wants to hear from jews. Because jews know. Don't we? It's an exciting time, really.